J. Seeley’s career was off to a less than ideal start at Rhode Island School of Design in the late 1960′s. His acceptance into the Master of Fine Arts program was regarded as a mistake by program leader and photo icon, Harry Callahan (an opinion shared by a string of celebrity visitors who failed to appreciate his experimental approach) He played hooky during the second year, hired to document and produce cover art and movie stills for The Joe Cocker Mad Dogs and Englishmen National Tour. After receiving his degree and a couple of years of residual work for record companies in New York and Los Angeles, he abandoned the music business and returned to printmaking and academic endeavors. Seeley’s focus over the years has been in making use of traditional and experimental printing techniques to render photographic images in ink. 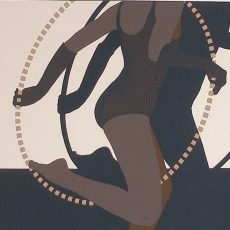 He has worked extensively with photo screen printing, photo etching, and various forms of lithography. Once, he created a photographic image on a wood block, via laser burning. It was rolling it up with ink and printed as a photographic woodcut. 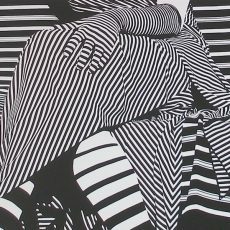 His long quest reached a point of artistic compatibility in the 1990′s with the emergence of Iris and Epson archival ink jet digital printing technologies. He was one of the first people to work with the flatbed scanner as camera, creating still life compositions by laying three dimensional objects directly on the glass bed of the scanner. In addition to the light provided by the scanner tubes he has used skylight and miniature external lighting to enhance these compositions. He continues to create scanned images, but has,in the past few years, returned to his favorite subject, the figure in the studio environment. The French website, Scannography.org, has featured some of the work in this series.